Garage doors typically have the same issues arise. Complaints of doors opening themselves, hanging crookedly, refusing to budge, or making awful screeching sounds are all common for our repair technicians to hear. Sometimes one problem can cause another, and you'll need professional assistance to find the cure. Our technicians inspect these issues when we repair your garage door to make sure that we've fully cured the problem, not just bandaged the symptoms until the next problem arises. If your door is noisy we need to take a look at your rollers and track to make sure that everything is lined up and well lubricated. Misalignment can cause your door to rub against the tracks, causing the noise. Rust is also a culprit with a noisy door, causing friction that shrieks and squeaks when the door moves. 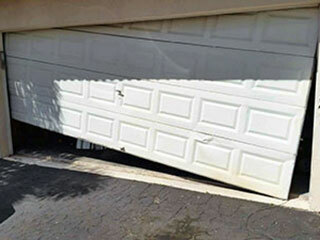 A crooked garage door could be caused by a broken spring or cable, which can also make your door impossible to move. If a spring breaks suddenly, it could knock the door off of the tracks as it falls. Then, not only will the door be too heavy to lift until the spring is replaced, it will also need to be placed back on its track and the rollers checked for damage. A door that seems to have a mind of its own typically needs to have its close limit switch adjusted, which is a simple fix for one of our professionals. These switches signal to the motor to turn off when the door is fully closed or fully open, and they are crucial for a remote controlled door. Allowing us to service your garage door repair needs will ensure that many of your future issues are controlled before they begin to cause you problems. Our talented staff at Garage Door Repair Andover has experience repairing anything that could possibly break in your garage door. We carry only the best replacement parts and guarantee quality service. Call us today to set up your appointment.